If you plan to use Veeam Agent for Linux 3.0.1 with Veeam Backup & Replication, you must install Veeam Backup & Replication 9.5 Update 4 or later on the Veeam backup server. Veeam Agent for Linux cannot work with Veeam Backup & Replication that is located behind the NAT gateway. You can store backup files created with Veeam Agent for Linux on backup repositories managed by Veeam Backup & Replication. To do this, you must select a Veeam Backup & Replication backup repository as a target location in the properties of the backup job. To store Veeam Agent backups, you can use a simple backup repository or a scale-out backup repository. You can also use Veeam Backup & Replication to manage Veeam Agent for Linux on computers in your infrastructure. As part of the Veeam Agent management scenario, you can remotely deploy Veeam Agent for Linux to your computers, as well as configure and manage Veeam Agent backup jobs in Veeam Backup & Replication. To learn more, see Veeam Agent Management Guide. If you create a backup job with the Veeam Agent for Linux command line interface, you need to specify a Veeam backup repository in the backup job settings. 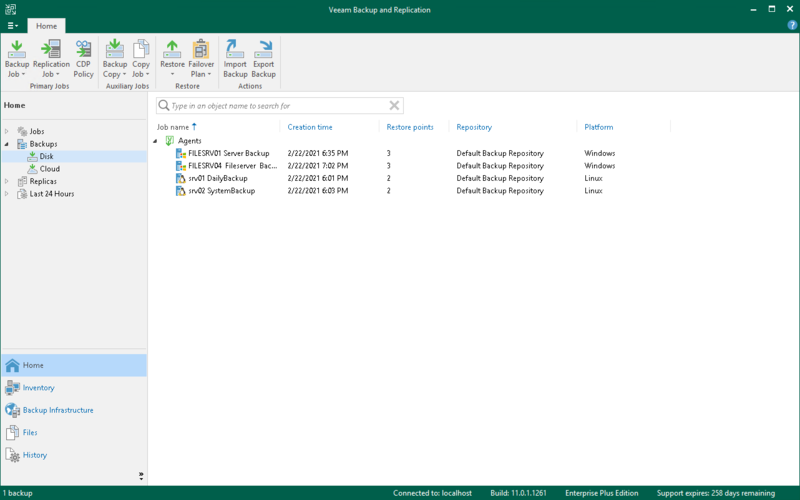 Veeam backup repository appears in the list of backup repositories after you connect to a Veeam backup server. To learn more, see Managing Veeam Backup & Replication Servers. Veeam Agent for Linux works with the Veeam Backup & Replication backup repository as with any other backup repository. Backup files are stored to a separate folder; you can perform standard restore operations using these files. The Veeam Agent for Linux backup job is displayed in the list of jobs in Veeam Backup & Replication. Backup files created with Veeam Agent for Linux are displayed in the list of backups, under the Agents node. Performed job sessions are available in the History view of Veeam Backup & Replication. Perform data protection operations: copy Veeam Agent for Linux backups to secondary backup repositories and archive these backups to tape. Perform restore operations: restore individual files and directories, application items from Veeam Agent for Linux backups; restore computer disks and convert them to the VMDK, VHD or VHDX format; restore to Microsoft Azure and Amazon EC2. Perform administrative tasks: disable and delete Veeam Agent for Linux backup jobs, remove Veeam Agent for Linux backups and so on.